Tip $5 and get Album Download of "Black Roses"
Stefan Valica, Banska Bystrica, Slovakia: do you have my address Alex? Write_A_NewSong: I don't see that the tips came out of my bank account, yet, if there is any problem, let me know and I'll PayPal you what I pledged. alexwinters: I should still have your address Stefan, I'll let you know if I don't. alexwinters: Philip, I'm guessing you won't see the transaction until Monday, but I'll holler if there's any issues, thank you. Write_A_NewSong: that works for me. Stefan Valica, Banska Bystrica, Slovakia: do you know already when is the next concert Alex? alexwinters: I'm not sure when the next one will be yet. I am thinking next month or early November. Will have to check my calendar I have a busy October coming up. CelestialBlueMusic : Yay! I caught some of your show! CelestialBlueMusic : Hey howdy hello! Glad I caught you! Just got home! CelestialBlueMusic : I love that couch! Immortalized. In our duet on you tube lol! Alex Winters - No Pants Required! it was like we were hanging out, and getting to know a little more about who you are. That's a cool way to spend an hour on a Saturday morning. 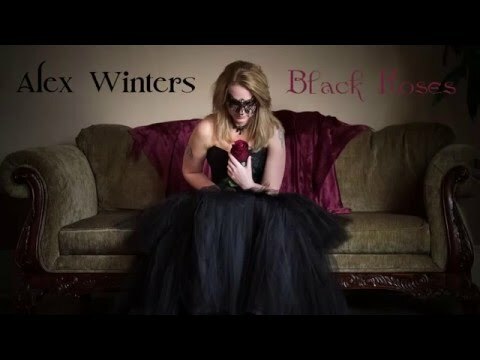 Album Download of "Black Roses"
Album Download of "Starting Over"
Autographed Physical CD of "Black Roses"
Autographed Physical CD of "Starting Over"
Alex Winters may look and sound the part of a sweetly accomplished, award-winning Austin singer-songwriter, but underneath her high-shimmer vocals and lithe, acoustic guitar melodies are evocative tales of dreamers and risk-takers, sung by an artist who’s unafraid to peer into the dark, while making her way into the light. Exploring the wicked beauty of love’s complications, creating romantic vignettes with dark twists and unexpected turns, and conjuring the deep feelings between soul mates lost and found, Alex’s songs merge a poet’s sensibilities with a finely-tuned ear and natural agility with melody. Writing, performing, and co-producing her solo debut, Starting Over with Steve Palousek at Awesome Works Studio, in Holland, Texas, and backed by a team of seasoned players---drummer John Stacy Jr. (Kevin Fowler, Bart Crow, Asleep at the Wheel), keyboardist Steve Maynard (Holly Tucker, Janice Maynard and the Country Sawdust Band), and Palousek (on lead, pedal steel and bass guitars), 360 Magazine called her vocals “seamless” and compositions “effortless.” And while Luna Guitars bestowed Alex with their first Shining Star award, and her acoustic duo, the Lazy Janes, made the finalist’s round of Georgetown’s Got Talent, her life wasn’t always that of a Texas troubadour on the rise: Alex’s musical journey began as an introverted 12-year-old guitarist in her home state of Washington. “Music has moved or touched me everyday of my life, but I was way too shy to ever even think about trying to be in a band” she says. But after years of religiously jotting down notes and writing her first songs, she eventually found the confidence to play a tune for a friend. “Next thing I know, I’m in the band,” she remembers. Encouraged to write, challenge herself, and be more out front, “They saw something in me that I couldn't,” she says of her bandmates in Yakima’s Eleven 69. Grateful to have gathered the stage and recording experience, after one album and an ep, Alex lit out on her own, toward a new life in Texas. Fully connecting with her own voice as a performing songwriter, reveling in a vision that is still introspective and sensitive, yet equally strong, enigmatic, and haunting, Alex continues to develop her unique solo repertoire. Ranging from the expressive “Almost There,” concerning the tightrope walk of new love, to the inner turmoil of the broken-hearted (“Turn Out the Light” and “Didn’t I”) and the explosive “Under Cover Lover,” (written from the perspective of a vampire), Alex reckons with the deep well of the human condition, of life and of love, in her heart-rendered songs. "It's hard for me to believe that just a few short years ago the thought of performing on my own terrified me,” says Alex. “The energy and support I receive from the audience is profound: It keeps me moving forward."